Naples is a bustling town in November! While you’re in town, take a look at our Favorite Listing and let us know when you’d like your private tour. 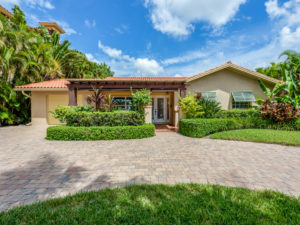 Marbella Lakes – Great Central Location! This exceptional home boasts loads of special features which include impact glass in all windows and slider, heated pool overlooking a lake, crown molding throughout, designer kitchen, hardwood flooring and brand new roof. There is a first floor den which can be easily converted back to a 5th bedroom with a full bath. Formal living room on the left and a formal dining room on the right. Kitchen features full height kitchen cabinets, state-of-the-art appliances, family room and dining area. Second floor features four bedrooms, three full baths, loft area, three walk-in closets, wood flooring in the loft, halls, master bedroom and master closets. Marbella Lakes clubhouse features two basketball courts, two Har-Tru tennis courts, gym, resort-style pool, children’s pool and play area. The reasonable fees include a full-time lifestyle director and a full-time on-site property manager. 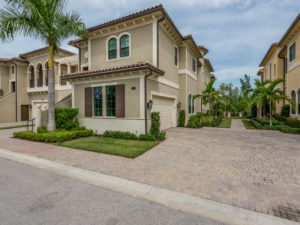 Marbella Lakes is centrally located and convenient to Mercato, the beaches and historic Fifth Avenue South. This impeccably maintained home offers lots of flexible space. Master bedroom and den on first floor and two bedrooms and a loft on the second floor. Volume ceilings, working fireplace and eat in kitchen are among the unique features. 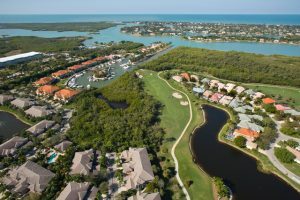 Windstar on Naples Bay is a gated community with a Tom Fazio golf course, clubhouse with Bay views and tennis and fitness programs as well as a shuttle boat to the private beach on Keywaydin Island. Club memberships available, but not required. Boat slip options available! Your boat in your back yard and close to shopping and dining, what could be better? Four bedrooms and two baths, newer kitchen with granite and stainless appliances, newer baths, heated pool and spa, boat dock with lift and tiled floors through out. Great income potential as weekly or monthly rental, or enjoy for yourself and your family. 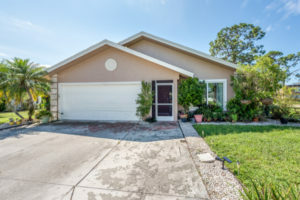 Move in ready and better than new! Huge, 2017, waterfront, first floor, 2 bedroom+Den, 2-1/2 bathroom, with attached 2 car garage. Open layout that truly lives like a single family home. Amazing for entertaining or just relaxing on your lanai overlooking the docks and water. Low Hoa’s too! 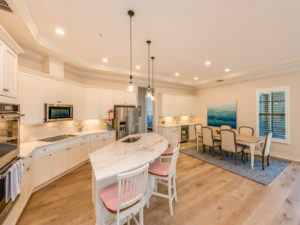 Do not make the mistake of buying and having to wait for a Regatta Landing golf course view when you can move right into this gorgeously upgraded waterfront home now. A must see, they are not building any more on Haldeman Creek, and this unit far more upgraded than the competition! Beautiful wide plank French Oak floors throughout, upgraded countertops, crown molding, plantation shutters, lights, fans, and so much more all done after the original sale just a year and a half ago. These are nicer upgrades than the builder can offer. 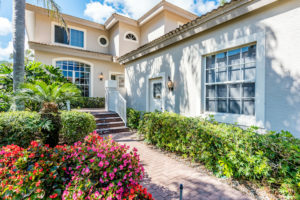 Located in the established gated community Windstar which offers both a Tom Fazio designed 18 hole golf course and private marina. Club membership not required and has both social and golf options. Boat slip opportunities available from 20-72 feet with lift possibilities. Bayshore Arts District- New Construction – Closed! – We have more like it! 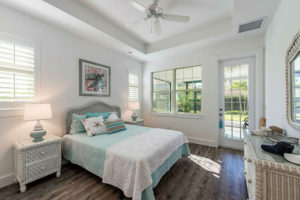 We recently closed on the Bahama Cottage in the in The Island Cottages in a Naples Bay Village. We have more being built in this same community. This is a new walkable infill community with good momentum and plenty more opportunities to build to suit in this redevelopment area. Walk to the Botanical Gardens, 360 Market, Sugden park, the bayside waterfront park and boat launch, and so much more! Call David Goebel at 239-285-2038 for more information. Read more about this community here. Slip #39. Wonderful opportunity to own a 50′ boat slip inside a deep water, gated harbor with dock master. No bridges and quick access to the Gulf. Slip location allows for direct easy in and out docking. Quiet, feature packed marina with beautifully kept wooden docks, club house with rest rooms, pool, spa, pump out, ice, electric and water to each slip. Gas, diesel, bait, etc located just next door at Hamilton Harbor. Dock master with golf cart keeps things running smoothly. This harbor is a well known hurricane hole dating back to its fishing camp days from the early 1900’s and is an absolutely terrific place to keep your vessel. You do not have to be a Windstar resident to purchase/use the slip. Slip may be rented out as well. Slip #30. Wonderful opportunity to own a 70′ boat slip inside a deep water, gated harbor with dock master. No bridges and quick access to the Gulf. Slip location allows for direct easy in and out docking. Close to the parking lot as well. Quiet, feature packed marina with beautifully kept wooden docks, club house with rest rooms, pool, spa, pump out, ice, electric and water to each slip. Gas, diesel, bait, etc located just next door at Hamilton Harbor. Dock master with golf cart keeps things running smoothly. This harbor is a well known hurricane hole dating back to its fishing camp days from the early 1900’s and is an absolutely terrific place to keep your vessel. You do not have to be a Windstar resident to purchase/use the slip. Slip may be rented out as well. This slip is being offered at less than the expected yearly maintenance cost of the yacht that could be birthed here. Slip #37. Fantastic opportunity to own a 71X21.59 boat slip inside a gated harbor with dock master. The slip is in a pie shaped corner making it huge. The smallest dimensions are the 7X21.59, but it opens up from there. No bridge, quick access to the gulf. Slip location allows for direct easy in and out docking. Close to the parking lot as well. Quiet, feature packed marina with beautifully kept wood docks, club house with rest rooms, pool, spa, pump out, ice, electric and water to each slip. Gas, diesel, bait, etc located just next door at Hamilton Harbor. Dock master with golf cart keeps things running smoothly. This harbor is a well known hurricane hole dating back to a fish camp from the early 1900s and is an absolutely terrific place to keep your vessel. You do not have to be a Windstar resident to purchase/use the slip. Slip may be rented out as well. Are you looking for a bit more land? We have some great options just a bit further north of Naples. THE BEST OF ALL WORLDS IS HERE! 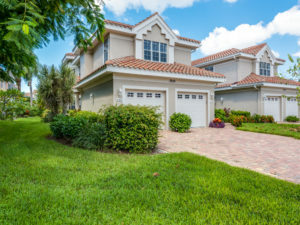 QUIET COUNTRY LIVING WITH EASY PROXIMITY TO SMALL TOWNS LIKE LABELLE AND CLEWISTON OR BIG CITIES LIKE FORT MYERS, NAPLES OR WEST PALM BEACH! 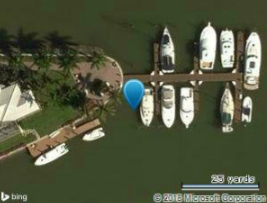 And a location on the intracoastal waterway’s Caloosahatchee River allows you to put in your own dock and have your sailboat or powerboat at your own house! A Special Exception with Glades County will allow you to bring your horses, llamas, goats, or sheep, etc. The home is a two-story ranch-style beauty with a metal galvalume roof. Owners have updated and opened up inside for a chef’s kitchen and family/dining room area. Living room offers a stone fireplace plus private area for den, office or play room for kids. There is also a full bath and laundry room downstairs. Upstairs are 3 bedrooms and two full baths. You will love the look of the open “rocking chair front porch” and enjoy your evening glass of wine on the screened back porch watching the sunset! Property is mostly fenced and gated. This property does not require flood insurance. The Port LaBelle Ranchettes is a deed-restricted area with annual HOA dues of $90/year. A SUPERIOR AREA FOR FAMILIES WHO LOVE THE WATER, LOVE ANIMALS & NEED LOTS OF ROOM! HERE IT IS! 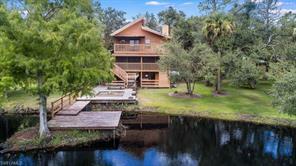 FAR FROM TRAFFIC, CONGESTION, AND NOISE…Located in rural Glades County, FL (SW FL) with a LaBelle address and promising solace and tranquility, privacy and seclusion! 20 +/- acres is lushly treed with oaks, pines, palms and tropical blooming flowers, and including an incredibly beautiful 3+/- acre pond which has a bridge to your own island! Property has two cedar homes, main & guest. Both homes are cedar framed with metal roofs. Main is 3-stories with bottom floor storage (vehicles, game room, “man cave”…… and even “dad’s own bathroom! 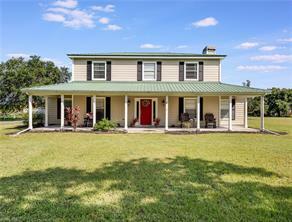 2nd floor houses living, dining, kitchen areas and a 2-sided wraparound screened porch overlooking pond & island. 3rd story includes a guest BR, full bath and master BR with its’ own private porches. Home #2 is a ranch-style cedar 2BR/1BA home with laundry rm, work shop, huge screened porch plus carport area for vehicles & equipment. There are 3 wells, two septic systems AND 2 RV setups . Get your kids off of the video games and build a tree house with them, camp out, ride dirt bikes, ATV’s or horses. Raise your kids to love the outdoors and to use their imaginations! Like this story? Join the thousands of others who read our free monthly newsletter. We write about the Naples real estate market and the wonderful Naples lifestyle.